Connecting with other artists is one of my favorite things! I love hearing their stories, their struggles, successes and what they've learned along the way. Being able to connect and encourage one another is so wonderful! How did you get into painting and how long have you been doing it? I've enjoy painting since I was a child. My mom and my aunts were primary school teachers and they always had art materials available around the house. When I was around 15 years old I started taking drawing and painting classes. It was really interesting to learn about drawing techniques, and to experiment with different materials. However, I didn’t enjoy drawing and painting what the teacher was telling me to do. I took classes for more than a year but decided not to continue because I wanted to create without so many "rules." I thought about going into art school but instead, I got a Bachelor’s degree in Early Childhood Education and a Master’s degree in Product Design. A whole decade went by and after a very busy and promising career path, I decided to take a break. I got pregnant, turned 30, and decided to go after this old dream of being an artist. Last year I joined a modern calligraphy course, which is something I’ve always wanted to learn. The experience of learning something new was amazing and it led me to start painting again. I was thinking about making illustration and stationery but when I got the canvas and the brushes, I could really feel that this was what I was passionate about. Exactly a year ago, I put my son in a daycare 2 times a week and used this free time to paint. I just wanted to experiment and create without any purpose. I committed myself to paint everyday, or at least try to paint everyday, and experiment different textures and styles. Now, my art career just turned one and I can’t wait to see how the future unfolds! Where do you paint and can you describe the space? I have a big empty basement that became my studio space. It is dark, cold and only has one small window in the corner, but it’s what I have. I decided to start creating even though my circumstances were not ideal, and I had to have a lot of discipline, perseverance and courage to keep going. Sometimes I also paint at my kitchen table or at my guest room because I really need better lighting. But it’s really good for my process to be able to just leave everything in my basement (some unfinished work, messy materials) and go right back to it later. What are some of the challenges or obstacles you face in making your art? My biggest challenge right now is to find my style and my voice. I have been painting random things, which is good for my creative process, but also difficult to my viewer/collector. I have been getting a lot of positive feedback but I also know that I need to set some boundaries for my creative process in order to become more professional in this field. 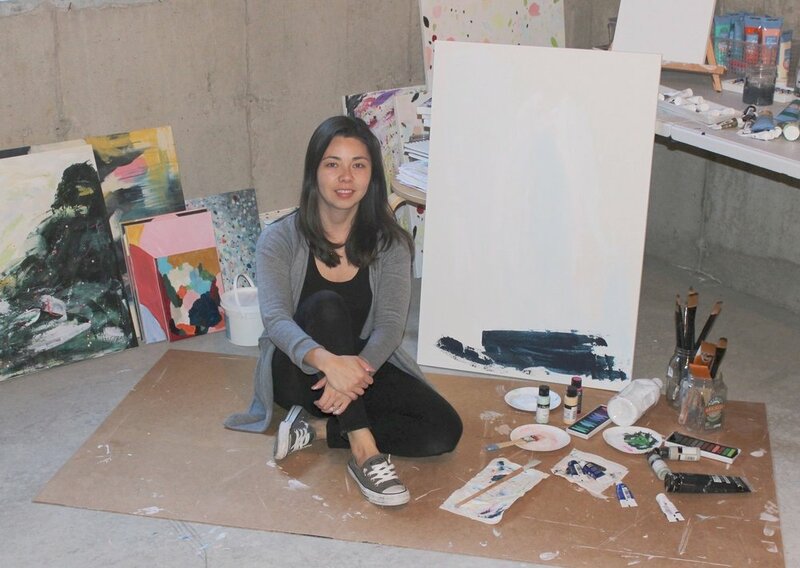 How do you balance your art career with raising a child? Raising my son is my priority and I try to fit my art career into my busy schedule. My husband and I share a lot of the house work, so that helps. My son goes to daycare twice a week and my husband takes care of bath and bed time every night. So, I try to fit my art making during nap times, evenings and a few hours every weekend. I can’t say that I balance motherhood and my art career, sometimes I don’t paint for days because something gets in the way, but it’s been working so far. I find inspiration in the everyday. I usually see patterns, color combinations and interesting shapes everywhere - in that perfect mint color in the horrible bathroom or the beautiful shapes in the sky when I look out the window. I can say that paying attention to mundane activities is what mainly guides my creative process. It helps when I’m choosing a color palette or just to simply getting my brushes and start making some marks. I also find a lot of inspiration while traveling and finding unexpected interesting stores or original local art. The Scandinavian culture also has a lot of influence on my work. I lived a few years in Denmark and I love their minimalism, simple but also very sophisticated design. How do you stay focused each week, to keep your business moving forward? During this first year I just wanted to make sure I was constantly creating every week and making progress. Now I feel the need to have a better management of my time to keep things moving forward. First, I just wanted to experiment and the result was beyond my expectations. I painted a lot, participated in a few group shows at a local gallery, sold and shipped many pieces to different places around the world (Denmark, UK, Ireland, United Emirates Arab, Brazil, Japan, Mexico, and USA). This second year I want to focus on finding my voice, my audience and building a strong body of work. How much time do you spend actually making art vs. marketing, selling, packaging, shipping, etc? I spend a lot more time marketing, selling, packing and shipping than actually painting. I usually paint just a few hours 3 - 4 days a week and I always share on my Instagram a little bit of my process. Where do you tend to get most of your traffic/followers? Instagram is my main tool. It’s where I share my work, my process, and where I interact with people. That’s also where I announce my new collections, offer my paintings, and get a lot of direct messages. I still need to learn more about how to use Instagram to reach a bigger audience, but I’m taking one step at a time. If you had one tip for an emerging artist, what would it be? It takes time. It takes time to experiment, to find your voice, to find your audience, to practice discipline, and to grow. I’ve tried to paint and pursue an art career before but I didn’t have the patience to experiment and to keep making art until I started making something that I actually like and enjoy. This time I’ve decided to commit to show up everyday, even when I don’t have the inspiration, or when I’m tired, or when I have no idea what to make. Just to be there, with all my tools, the ideas start to come and I can see progress everyday. So, my advice is to keep showing up everyday to do your work and be persistent.